GAME OF THRONES roared back onto the Emmy battlefield, topping today’s nominations with 22 bids but with a formidable opponent in last year’s winner The Handmaid’s Tale, while a streaming platform made history by earning the most bids for the first time. The short-lived revival of Roseanne, meanwhile, cancelled because of star Roseanne Barr’s racist tweet, drew two nominations, including a supporting actress nod for Laurie Metcalf. ABC axed the programme, after Barr issued a tweet suggesting that former Obama adviser Valerie Jarrett is a product of the Muslim brotherhood and the Planet of the Apes. She later apologised for the tweet in a tearful interview. Netflix’s 112 nominations took away the front-runner title that HBO held since 2001, giving cable and broadcast networks more reason to fear their future with viewers as well as honors. HBO claimed 108 bids. Game of Thrones helped boost the premium cable service’s total and became the most-nominated series of all time, with its 129 nods topping the 124 nominations earned by ER. Donald Glover’s Atlanta was the top comedy series nominee the with 16 bids, poised to take advantage of the absence this time around of three-time winner Veep. Atlanta will face newcomers including The Marvelous Mrs. Maisel, Glow and Barry. Others in the category include black-ish, Silicon Valley, Curb Your Enthusiasm and Unbreakable Kimmy Schmidt. The newbie comedies aced out long-time Emmy favorite Modern Family, a five-time winner and perennial nominee since it debuted in 2009 on ABC. Its absence leaves just one network contender for best comedy, ABC’s black-ish, which also earned nods for Tracee Ellis Ross and Anthony Anderson, who noted his urban California roots. Killing Eve star Sandra Oh made history of her own, becoming the first actress of Asian descent to be nominated for lead acting honors in a drama series. Oh had earned five supporting bids for Grey’s Anatomy. The TV industry has made recent strides toward inclusion, with Glover and Sterling K. Brown of This Is Us winning top acting awards last year and both nominated again. “I think we’re all happy with the direction we’re going. This is the most diverse class of performer nominees we’ve had — we’re almost up to a third, which is fantastic,” Maury McIntyre, TV academy president. “There’s still a lot of work to be done in terms of gender” and with behind-the-camera jobs, he said. CNN’s Anthony Bourdain: Parts Unknown, received a nomination in the category for best information series or special, which also includes shows with Leah Remini and David Letterman. The show featuring chef-writer Bourdain, who died in early June, has won four Emmys. The Emmys ceremony takes place on 17 September. 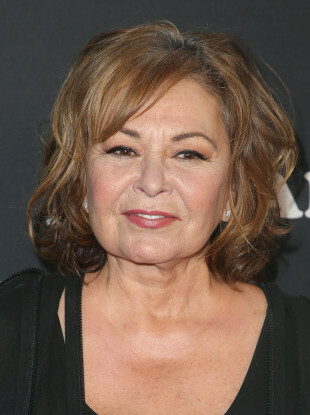 Email “Roseanne nominated for two Emmys despite being cancelled over star's racist tweets”. Feedback on “Roseanne nominated for two Emmys despite being cancelled over star's racist tweets”.